A sour is a traditional family of mixed drinks. 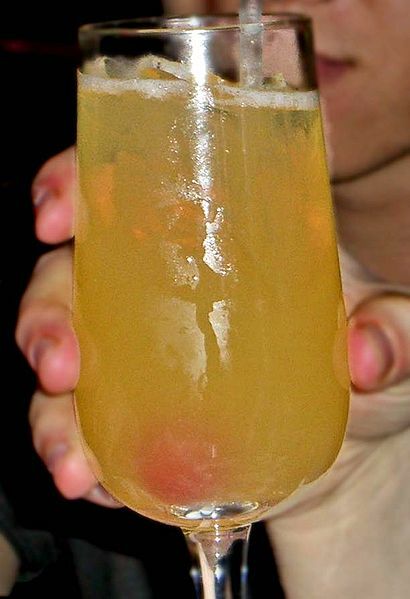 Common examples of sours are the Margarita and the Sidecar. Sours belong to one of the old families of original cocktails. Sours are mixed drinks containing a base liquor (bourbon or some other whiskey in the case of a whiskey sour), lemon or lime juice, and a sweetener (triple sec, simple syrup, grenadine, or pineapple juice are common). Left: A typical whiskey sour in a non-standard glass. The flavour of a sour, especially a whiskey sour, has been likened to that of sour sweets that leaves the mouth watering and the tongue tingling but always wanting more. Brandy Sour or Brandy Daisy — brandy, curaçao, sugar, lemon juice, shaken and strained into a wine glass. Cypriot Brandy Sour — Cyprus brandy, lemon cordial and bitters, stirred in a tall glass, and topped with soda or lemonade. Santa Cruz Sour — Santa Cruz rum, sugar, lemon juice, shaken and strained into a wine glass. Midori Sour - Honeydew melon liquor, grenadine, lemon juice. Poured properly, it resembles a green Tequila Sunrise with visible layers. Caipirinha — Cachaça, sugar, lime, ice in an Old fashioned glass.